A loyal member of Fly Casino’s sister property - Omni Casino, this lucky player decided to loged into play Everybody’s Jackpot on November 8th and after several spins won the progressive jackpot! The customer service has been unfailingly friendly, attentive and helpful. I like the range of games and the reliability and responsiveness of the site. As to the win... frankly, I was blown away and couldn't quite believe it until you confirmed it. I never believed I would hit a massive jackpot like that. Just goes to show that a big win is, quite literally, just another spin away. As this jackpot is “everbody’s jackpot” we had several winners here at Fly Casino as well. Congratulations from all of us here at Fly Casino! Playing this fantastic Jackpot Game is for everyone! The Jackpot belongs to everybody… bet enough to make sure you qualify for it. Even if you don’t win the big Jackpot you can still get part of it! The game is played on a “nine block” - 9 reels and with a fixed number of 8 active paylines. 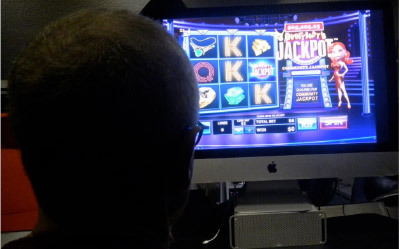 Winning symbols should be consecutively aligned on an active payline, except for the Scatter symbols that pay in any position and order on the reels. Paylines 1 through 5 pay left to right and paylines 6 through 8 pay from the top most reel to the bottom. Everybody’s Jackpot – It’s your Jackpot too! The Mystery Progressive Jackpot allows players that qualify in the game, by having bet a certain amount, to win or share the Jackpot. 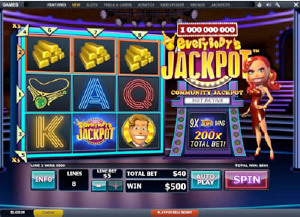 The Jackpot is triggered randomly during main game and the player whose spin did that, wins 70% of the Jackpot prize. The remaining 30% are distributed amongst the qualifying players half evenly and half proportionally according to the total bets placed during the last 24 hours. The Jackpot cannot be triggered but can be shared during Free Games. The Wild symbol appears only during Free Games on the central reel and substitutes all other symbols except Scatter. Special Lines The winnings on lines 4 and 5 pay TRIPLE except for the Scatter wins. Scatter symbols pay when two or more appear anywhere on the reels. 3 or more Scatters anywhere, either in main or free game, trigger 12 Free Games with a Wild symbol. 75% up to 150.00! From 00:00GMT until 23:59 GMT, all members are invited to receive a 75% bonus up to £/€/$150.00 bonus on your deposits £/€/$30 or more made. 150% Value Monday! From 00:00GMT until 23:59 GMT, all members are invited to receive a 150% bonus up to 150.00 on your deposits of $/£/€10 or more.